On March 26, Ethiopian authorities arrested journalists Eskinder Nega and Temesghen Desalegn, Zone 9 bloggers Befekadu Hailu and Mahlet Fantahun, and De Birhan Blog author Zelalem Workagegnehu. All have previously been jailed for their work as journalists or human rights activists. They weren’t the only ones to be targeted during the week of March 26. A local source of Global Voices, who asked not to be named, estimated that more than 20 journalists, academicians, and prominent opposition figures were arrested. Civil society advocates from around the world called for the release of 11 journalists in a letter issued by the Association for Human Rights in Ethiopia. Nega, who is a prominent political journalist, had previously spent nearly seven years behind bars on terrorism charges. He was released from prison several weeks ago, on February 14, only to be re-arrested this week. …our condition in prison is inhuman, to say the least. Better to call it jam-packed than imprisoned. About 200 of us are packed in a 5 by 8 meter room divided in three sections. Unable to sit or lay down comfortably, and with limited access to a toilet. Not a single human being deserves this, regardless of the crime, let alone us who are detained unjustly. The global community should be aware of such a case and use every possible means to bring an end to our suffering. Hailu and Fantahun have both worked with the Global Voices community. In 2014, they were arrested along with seven of their blogger and journalist colleagues, all due to their participation in the Zone9 collective blog, where they wrote about their government's obligations to human rights and constitutional law. 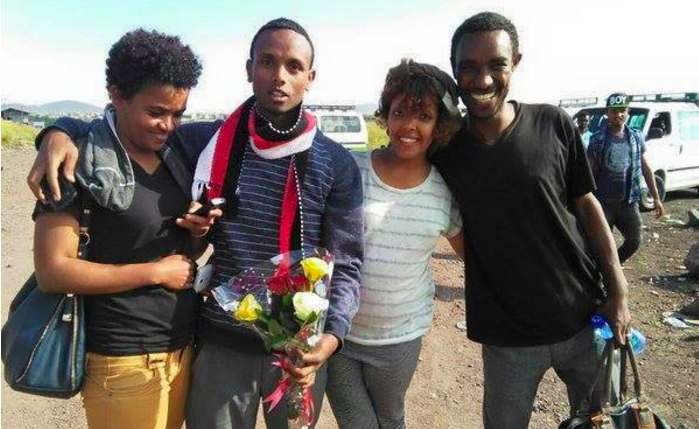 After 12 weeks of arbitrary detention, the writers were charged under Ethiopia’s anti-terrorism proclamation and spent more than a year behind bars. Shortly before a state visit by then-US President Barack Obama in July 2015, some were released without explanation. The rest were acquitted and released in October 2015. Since then, both bloggers have lived under close surveillance by state authorities. All this has taken place in a tumultuous political environment. Since mid-2015, thousands of Ethiopians have begun to demand more political freedoms and social equality and a stop to government land grabs in the Oromia region, which is home to Ethiopia's largest ethnic group. The government response has been brutal: Hundreds have been killed, thousands have been arrested, and critical voices — both on and offline — have been systematically silenced. In late 2017, Ethiopia’s ruling coalition began to splinter, resulting in political fallout and the January 2018 resignation of Hailemariam Desalegn as prime minister. So far, 7,000 people have either had charges against them dropped or been pardoned — but as of this week, some of those released have been re-arrested. Their fate remains uncertain. Data scientist-turned-whistleblower Christopher Wylie, the former head of research for Cambridge Analytica, told UK parliamentarians that the Indian National Congress, a prominent opposition party in India, was a client of the controversial data mining firm. Allegations that other Indian political parties (including Prime Minister Narendra Modi’s BJP party) had contracts with the UK company are also circulating. In his deposition before a UK parliamentary committee on March 28, Wylie described various activities of the data mining firm, which has dominated headlines since mid-March, when journalists from The Observer and The New York Times revealed that the firm exploited Facebook users’ behavioral and psychographic data — without their knowledge — in service of the US presidential campaign of Donald Trump. Cambridge Analytica was also involved in election data mining with the intent to undermine elections in Nigeria, Africa’s most populous nation. On the heels of the Cambridge Analytica revelations, Prime Minister Shinzo Abe’s chief cabinet secretary told reporters on March 27 that the Japanese government is investigating unlawful use of personal data gathered from Facebook. Japan’s Personal Information Protection Act prohibits companies from sharing user data with third parties without explicit consent from users. Shortly after news broke of Cambridge Analytica’s non-consensual exploitation of Facebook user data, the Electronic Frontier Foundation published a short guide to help Facebook users limit the degree to which third-party apps can access your data. Check it out here. Turkey’s parliament passed a new law that empowers the country’s broadcast regulator to impose a licensing scheme for online video platforms (such as YouTube, Periscope and likely Facebook) that will allow the regulator to monitor and sanction platforms that do not promptly comply with content removal requests from the government. All platforms will be required to obtain a license from the regulator — those that fail to do so will risk being blocked altogether. Syria’s Council of Ministers passed an amendment to Cybercrime Law 17/2012, which penalizes “anyone who incites or promotes crime through computer networks” with prison sentences ranging between one and three years and a fine of up to US$1,500. The amendment creates a specialized court of first instance for cybercrime cases, whose rulings can then be challenged at the Court of Appeal. Previously, individuals charged under the Cybercrime Law could be tried in any court, including military tribunals. According to the database, 61% of those who have been prosecuted under the law were “raising awareness of issues and holding others to account.” Half of the cases involved criticism of the state. All those who have been charged under the law have also been convicted. Australian Green Party Senator Jordan Steele-John put forth a motion to support laws protecting strong encryption in digital communication technologies and to fortify requirements for investigators to obtain a warrant before undertaking digital surveillance of citizens suspected of criminal activity. Afef Abrougui, Ellery Roberts Biddle, Nwachukwu Egbunike, Rohith Jyothish, Karolle Rabarison, Mong Palatino, Nevin Thompson, and Sarah Myers West contributed to this report.